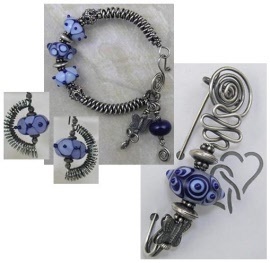 A lampwork glass bead in shades of royal blue is individually handmade and measures approximately 20 mm x 8 mm. Light blue coloring is not a true blue but actually takes on more of a light purple color depending on lighting or the clothing it is worn with. A sterling silver butterfly, beads and 16 gauge wire complete the design and have been dipped in liver of sulfur for an antiqued appearance. All wire is hand coiled and shaped. This pin measures 2⅞ inches in length x ¾ inches in width and weighs approximately 0.6 oz. Wears best on corduroy or denim jacket. 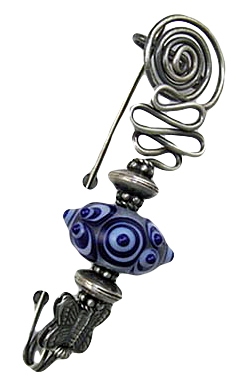 Earrings are created using a 15 mm x 8 mm lampwork glass bead accented with a coil of sterling silver and measures 1⅞ inches from top of earwire to bottom of dangle. Earrings available, as an additional purchase.